The Ultimate Penny Stock Reviews - Legit or Scam? 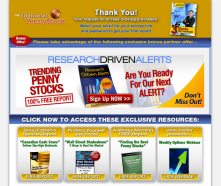 The Ultimate Penny Stock Reviews – Legit or Scam? The Ultimate Penny Stock, found online at TheUltimatePennyStock.com, is a free financial newsletter that claims to provide investors with fast, reliable information from top penny stock analysts. Becoming a member of The Ultimate Penny Stock provides you with Beaking Penny Picks from Top Stock Analysts, Stock Profiles with video analysis, and over $1500 worth of investing memberships and tools. You can sign up for The Ultimate Penny Stock newsletter for free, including signing up for both email and/or text message alerts for stocks that require fast acting investment, as most penny stocks do. The phrase “penny stocks” is the popular term for microcap stocks or small cap stocks, which are stocks that trade under $5 a share, though most penny stock alert companies will focus on recommending stocks that trade under $1 a share. Penny stock trading has become very popular in recent years, but it can be a risky venture. What makes penny stocks so popular – how extremely cheap they are – also makes them potentially dangerous. Historically speaking, because penny stocks are so cheap, they are easily manipulated. Since a share is so affordable, a single company or investor can purchase hundreds or thousands of shares for a reasonable amount of money. The purchased shares will cause the value of the stock to rise, allowing this same investor to use the recent rise in stock prices to influence others to purchase this same stock. Then the investor can sell their shares for a profit at the new increased price, and walk away, resulting in the stock prices falling again. Many investment newsletters are actually promotional tools that are advertising the stocks of companies they partner with in order to raise their stock prices. TheUltimatePennyStock.com says that it is not compensated in any way for publishing information about companies in their reports or newsletters. However, they do partner with certain companies for advertising purposes and warn their users that their policies do not extend to their partner companies, of which they have many, such as ResearchDrivenAlerts.com. This means that it is important to research every company or website that you potentially give your information to, in order to determine how they are doing business and whether or not it is in your personal best interest. The Ultimate Penny Stock ? Average Rating for " The Ultimate Penny Stock " is 2 out of 5 based on 3 reviews. Total scam. All he does is pick a stock hype it and hope people are stupid enough to listen to him. I got burned 2 times. Stocks will go up a little , then people start dumping. He will keep emailing you his bull hype and tell you to keep holding on, and that there will be breaking news. If no one continues to buy, he mysteriously disappears and you get no more emails. It is an ultimate loser! I also joined and was told EURI would take off. he hyped it for several days, it jumped up a few cents and then went flat. He tried to blame the pull backs on short sellers and after several days no more emails followed. TOTAL SCAM. He is all part of the pump and dump scams. Look what he did with HADV. Pushed and pushed saying it would go to twelve. Then it crashed to.2, he selling out at the top. And guess what? A sudden halt to his pushy email newsletters. Wow!! The same thing happen to me!! We have to protect ourselves from an individual like this!! HADV!! Was a huge success at first!! Then he will send out emails saying hold onto shares until its too late you loss all your earnings and profits!! Then all of a sudden he disappears!! Wow!! BLKG. Is going up!!!! Wooohooo!!! !